Sir Bradley Wiggins, CBE (born 28 April 1980), nicknamed "Wiggo", is a British professional road and track racing cyclist who rides for the UCI Continental team WIGGINS, after leaving Team Sky. 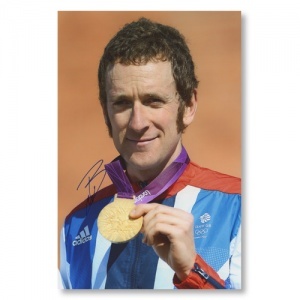 Wiggins began his career on the track, but has made the transition to road cycling and is one of the few cyclists to gain significant elite level success in both forms of professional cycling. The size of the photo is 12" x 8" inches and is signed very clearly in blue sharpie marker. The picture can be framed in a high quality black frame. The item can be purchased framed or unframed.